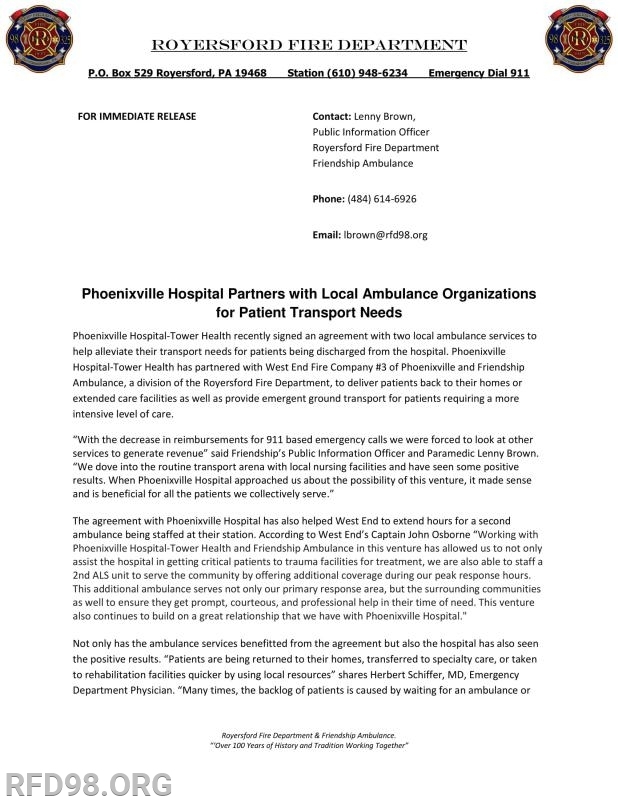 Phoenixville Hospital-Tower Health recently signed an agreement with two local ambulance services to help alleviate their transport needs for patients being discharged from the hospital. Phoenixville Hospital-Tower Health has partnered with West End Fire Company #3 of Phoenixville and Friendship Ambulance, a division of the Royersford Fire Department, to deliver patients back to their homes or extended care facilities as well as provide emergent ground transport for patients requiring a more intensive level of care. The agreement with Phoenixville Hospital has also helped West End to extend hours for a second ambulance being staffed at their station. 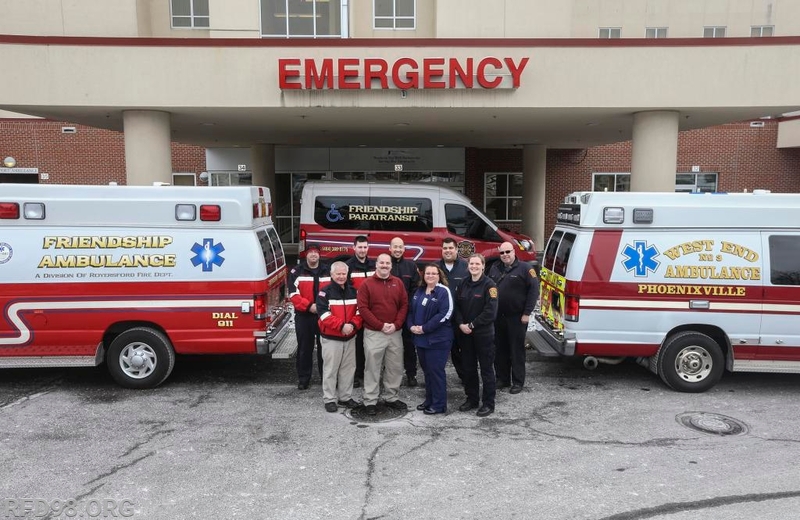 According to West End’s Captain John Osborne “Working with Phoenixville Hospital-Tower Health and Friendship Ambulance in this venture has allowed us to not only assist the hospital in getting critical patients to trauma facilities for treatment, we are also able to staff a 2nd ALS unit to serve the community by offering additional coverage during our peak response hours. This additional ambulance serves not only our primary response area, but the surrounding communities as well to ensure they get prompt, courteous, and professional help in their time of need. This venture also continues to build on a great relationship that we have with Phoenixville Hospital." Located in Phoenixville, Pa., and a member of Tower Health, Phoenixville Hospital is a 139-bed facility that provides comprehensive medical services through emergency room visits, inpatient admissions, outpatient procedures and community outreach programs. Phoenixville Hospital’s services include an award-winning cardiovascular program, a fully accredited cancer center, NAPBC-accredited breast health center, an acute inpatient rehabilitation center, and a large robotic surgery center. Phoenixville Hospital is accredited by The Joint Commission and has been recognized for its quality outcomes and clinical expertise across services lines that include joint replacement surgery, advanced heart failure care, and the designation as a Primary Stroke Center. For more information, visit www.phoenixville.towerhealth.org. More information about West End Fire Company #3 of Phoenixville can be found at http://www.westend67.com/.